Junk silver bags are usually referred to pouches holding junk silver dimes, quarters and other coins with a face value of $1000, that contain approximately 700 ounces of pure silver. Low purchase premiums compared to costly silver rounds make junk silver purchases a desirable investment for multiple purposes. Most silver junk coins are comprised of 90% pure silver with copper alloys to make them more scratch resistant and last longer in circulation. One of the unsurpassed benefits of such coins is that they have legal tender and are widely recognized as means of payment, which is especially important in a situation of hyperinflation or complete economy collapse. Fearful individuals are buying junk silver junk silver bags in fear of severely devaluing US dollar for survival purposes. In harsh economic times like, for example, Great Depression or 2002 Argentinean currency default resulting in massive banks’ closings, people go back to the basic time tested means of payments, silver and gold coins. Gold coins might be too highly valued and impractical to pay for everyday necessities; junk silver coins, on the other hand, are perfect as means of survival. 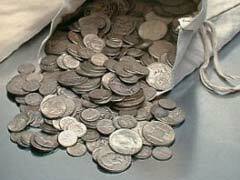 Savvy silver investors view junk silver bags as their best kept secret. While novice investors are spending loads of money on buying silver bullion bars and coins, real silver pros are buying junk silver bags due to their low cost per ounce of silver ratio and legally accepted tender. Silver coin collectors might buy junk silver bags due to low junk silver prices in hopes that one day their ancestors might appreciate their investment and collector value. But this stands true for a very small percentage of consumers; most individuals still buy junk silver bags for their investment and survival benefits.